Family caregivers are the unsung heroes of every community, and they often give far more of themselves than they let on. 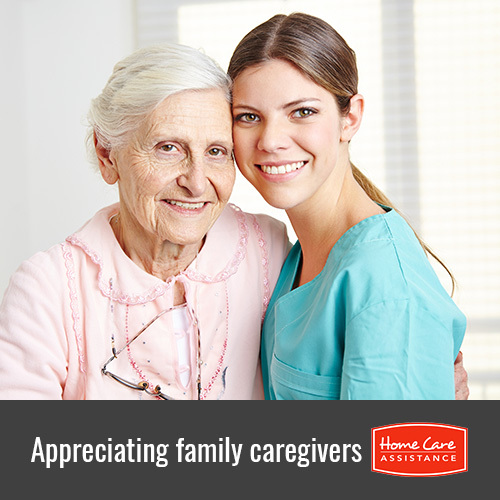 As you think about the family caregivers in your life, remember these reasons why they deserve appreciation. For many family caregivers, each day is a new experience. Since a senior’s care needs can change rapidly, caregivers must quickly respond and adjust to the new routine. Whether caregivers are learning how to check a loved one’s insulin for the first time or researching a new medication’s side effects, they are always finding ways their changes can help them provide better Harrisburg, PA, senior home care. Today’s sandwich generation is just as likely to be dropping their kids off at school as they are to be driving an aging parent to the doctor. This means there are often very few breaks during the day, and family caregivers in Harrisburg sometimes sacrifice their relaxation to make sure everything gets done. Some families have painful events in the past that make caregiving even more difficult. Perhaps a family caregiver never got along with his or her parent as a child, or they may have had a negative relationship as adults. Whatever has happened, family caregivers are able to put the past behind them and focus on spending quality time bonding with their parents in ways they never got a chance to before. Many aspects of caregiving are potentially embarrassing for both family caregivers and their loved ones. From planning shorter trips to avoid incontinence accidents to teaching their loved ones to use dressing aids, family caregivers are always on alert for ways to increase their loved ones’ comfort. Trying to balance letting a senior loved one be independent with maintaining personal hygiene is a fine line that deserves recognition. Family caregivers might never outright say it, but they have likely skipped an enjoyable activity at least once in the past week. Though the sacrifices are worth it, it is also important to ensure family caregivers take care of their physical and mental health. Planning for even a few hours of Harrisburg, PA, respite home care is all it takes to revive a family caregiver’s motivation to continue to go above and beyond his or her call of duty. If you are caring for an elderly loved one and need additional assistance, turn to Home Care Assistance of Harrisburg. Our professional caregivers can take over your loved one’s care and give you time to attend to errands and personal care, maintain your career, or even just relax for a few hours. For more information on our respite and live-in care, call (717) 540-4663 today to schedule a complimentary consultation.